"Announcing, the Free Cutting Edge Software That Lets You Rack up the Hits at Breakneck Speed!" Are you fed up with the amount of traffic your website receives compared to the countless hours you spend surfing? Would you like to earn more credits for your valuable time, without paying extra money for upgrades? I couldn't tell you how many hours I've spent surfing traffic exchanges. I've surfed all kinds of exchanges in order to maximize the number of credits I earn per hour. I've surfed 1:1s and seen dismal delivery, I've sniffed out the most rewarding dynamic surfing sites, and I've even upgraded at some exchanges. But then I discovered a little secret that made it all so much easier. You can surf up to 40% more efficiently - FREE! All it takes is some software to maximize the speed with which you switch tabs. Your browser has a shortcut to make this quicker, but I found a way to make it even faster still! This software is so powerful, that I have been called an idiot for giving it away, but I am not budging for now. Just look at what others have to say about it! I have been surfing traffic exchanges since early 2000. Jay Hines' Quick Tab Change is the first tool devised to make surfing traffic exchanges with a tabbed browser smooth and easy. A tool devised for the serious surfer. Way-to-Go Jay! 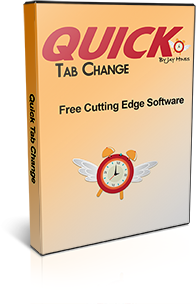 I just started using the Quick Tab Change this morning and was totally amazed at the ease and speed of my surfing. No more clicking on the tabs allows me to completely focus on the websites and bonus pages. Thank you so much for sharing this terrific surfing tool. I love it and will use it always. Okay, But You Certainly Can't Be Giving This All Away for Free... Right? WRONG! You need this tool and those resources if you want to be succesful with the traffic exchanges. Let's face it. It's hard enough to get any good advice and software that leads to actual traffic exchange results for free, but I want to be bold. I'm pinching myself pretty hard here... But I'm staying bold, for you! It's Free, Fast and Easy. It's a No-Brainer. It Begs the Question... "What Are You Waiting For?" So seize the moment and grab your free copy right now by clicking the download button above. There is no risk, and the reward is huge!